→Stainless Steel vs. Aluminum Pressure Cooker: Which One Is Better? There are two predominant types of pressure cookers in the market: stainless steel and aluminum. Each has its own advantages and disadvantages, but one remains to be more suitable to a certain set of people with different needs and preferences. It means that one is better than the other depending on the person using it and her specific cooking standards. 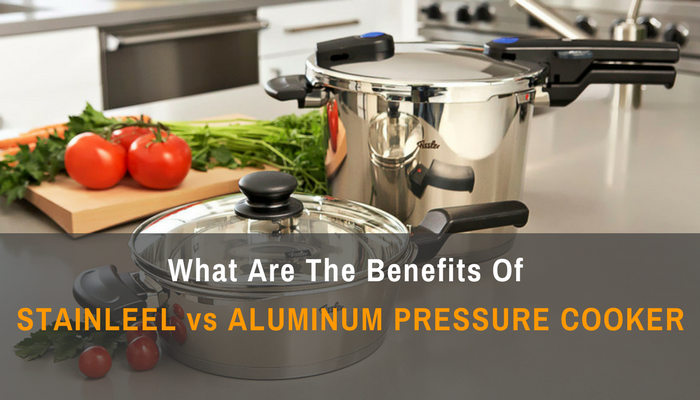 To give you a clearer comparison, here is a detailed account of stainless steel vs aluminum pressure cooker. Heavy-duty material: It is thick, so it is certain to outlast its aluminum counterpart by years. Even when used often, it does not get any significant damages from the heat and repeated cleaning. Easy to clean: As the term implies, stainless steel does not get scratches, stains and rust easily. Because of that, fast and simple cleaning often suffices. Resistant to scratch, stain and corrosion: Even when accidentally used with a sharp ladle, abrasive cleaning solution, rough cleaning cloth, or acidic ingredient, it is guaranteed to stay strong and damage-free for the longest time. Less prone to producing food burns: As the material does not absorb and distribute heat easily, it is less prone to burning foods even when unintentionally forgotten or overcooked. This is definitely the perfect kitchenware for people who are still on their way to learning cooking. Longer-lasting brand-new finish: With proper maintenance, you are guaranteed to still see your face on its shiny surface years after its first use. Stainless steel pressure cookers remain elegant despite heavy and regular use. More expensive: As you would expect from a material that is longer-lasting, the price is also unsurprisingly higher. The price of a stainless steel pressure cooker oftentimes reaches 50% to 100% of what you would pay for an aluminum one. The extra price is worth every cent though, as what you have learned from the advantages above. ​Heavier built: Although heavier built means more durable material, the weight can pose big problems for some people, especially if they need to remove the entire pressure cooker from the stovetop. When not handled properly, it can lead to accidents and not just wasted foods scattered on the floor. The brand you want to buy should have a strong handle to prevent accidents. In some cases, this leads to uneven cooking, especially if the food is not properly placed on the pan. Many brands of stainless steel pressure cookers put copper under the lid to compensate for this. Longer heat retention: There is really no problem with it for as long as you constantly pay attention while cooking. Longer heat retention only means that your food tends to be overcooked when not removed from the pressure cooker as soon as done. This is because stainless steel traps heat more effectively than aluminum. Those who are not familiar in using it might have saggy vegetables and dry meat for dinner. Nonetheless, with proper cooking skills, stainless steel pressure cookers can be used to ironically slow cook some meals for better finish without risking food burn. Inexpensive: The price often decides who wins between stainless steel vs aluminum pressure cooker. Who does not want an effective cooking companion for almost half the price anyway? 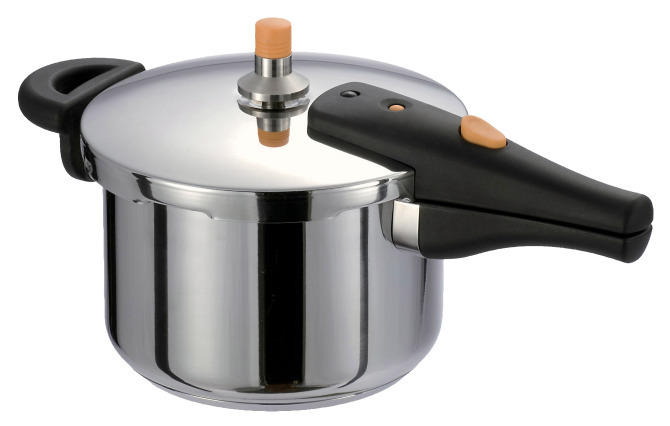 This is the perfect choice if you want to experience pressure cooking but on a tight budget. Light to carry: Petite moms will definitely find this lightweight material convenient not only when transferring from place to place but also when cleaning. It is easy to carry even when full. ​Very effective heat conductor: Aluminum is one of the most effective heat conductors among all the metals. This means that food is cooked faster and the heat is distributed more evenly, also resulting to more even cooking of all sides. Ideal for large-volume cooking: Most industrial-type pressure cookers, especially those used for canning, are really made of aluminum because of its effectiveness in distributing heat and its lightweight build. Shorter lifespan: As you would expect from a thinner material, the lifespan is also expected not to last very long. It is prone to damage when not cleaned and used properly. You may want to take sharp objects away from it. Warps easily: It is not rare for an aluminum pressure cooker to warp over time because of its thinner material. It can also be a big problem if you often carry it with heavy food inside. Prone to scratching, staining, and rusting: Unfortunately, even with careful cleaning and usage, it is bound to get damages over time. There is nothing you can do about it. Prone to burning food: It cooks food faster, yes. However, when the one using it does not pay attention, there is a big chance of serving burnt food afterwards, especially if some parts of the food stick to the bottom surface. To decide which one wins the stainless steel vs aluminum pressure cooker battle, here is a brief comparison between the two products. Cost: Aluminum is definitely more affordable, but stainless steel is more expensive for a reason. Durability: Stainless steel is meant to last for years even with regular use, while aluminum may not last long. ​Maintenance: Overall, both are easy to maintain, but stainless steel is undoubtedly easier to clean. ​Function: Aluminum is a more effective cookware, but stainless steel does not lag far behind (especially if you know how to use it). ​Output: While an aluminum pressure cooker cooks faster, it is generally accepted that a stainless steel pressure cooker produces higher quality food. 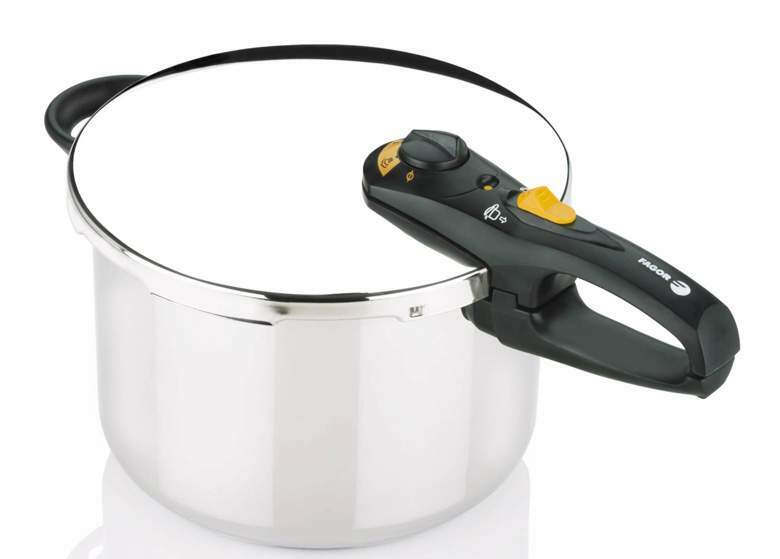 Safety: A stainless steel pressure cooker is heavier than an aluminum pressure cooker, but with care when cooking, anyone can find both of them safe to use. Overall, the battle of stainless steel vs aluminum pressure cooker is clearly won by stainless steel pressure cooker both in terms of effectiveness as a reliable cookware and value for money. Its downsides are actually caused by its advantages that aluminum pressure cooker brands can only dream of. In this case, you might as well compromise some of your preferences to gain a higher-quality product that only produces scrumptious meals. Stainless steel pressure cooker is a tad more expensive but is also more reliable in the kitchen.